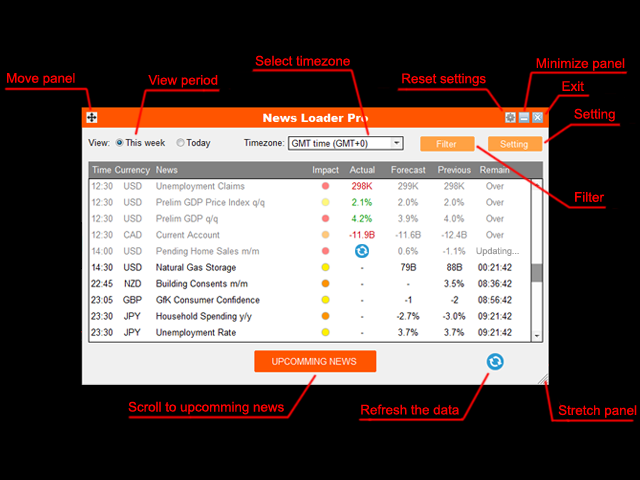 News Loader Pro is a tool that automatically updates every economic news in real time with detailed information from several online data sources. It uses the unique technology to load data with full details from popular Forex websites. An alert will be sent to your mobile/email before an upcoming news release. Moreover, it also marks the news release points on the chart for further review and research. 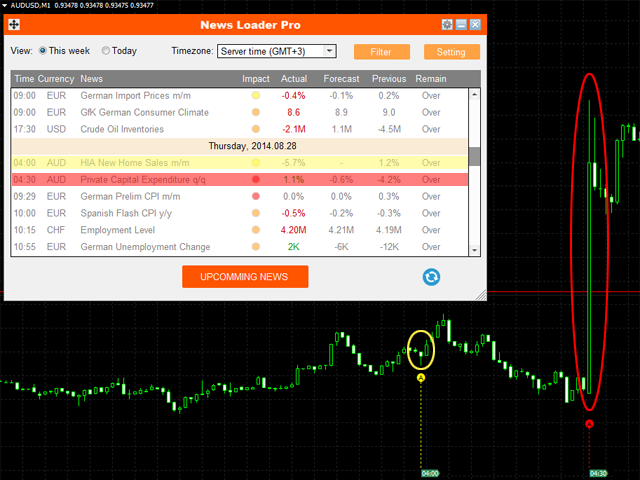 In Forex trading, news is one of the important factors that move the market. Sticking with news information will help you to have better trading decisions, or even trading right at the news if you are a news trader. 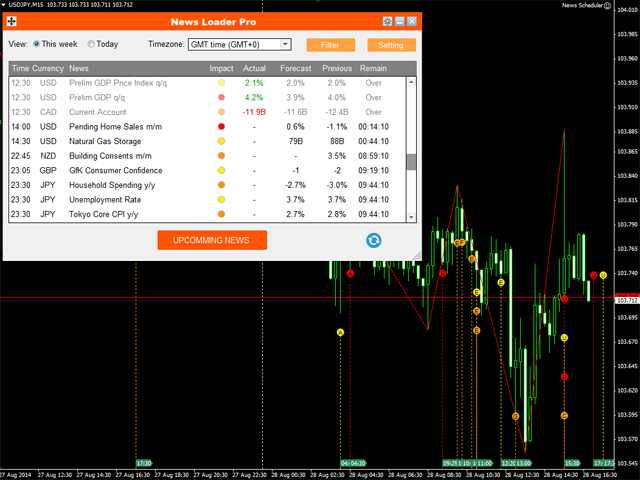 With this tool, a whole press center is loaded into your MT4 now. You must add data source's URL to Options -> Expert Advisors -> 'Allow WebRequest for listed URL' in order to let News Loader Pro load news data from the source. Please adjust the clock of your computer in order to let News Loader Pro run with correct timer. Support multi-data sources: at the current version, it supports ForexFactory.com, DailyFX.com, etc. (may add more in the future). News are loaded with full detailed information (explanation, effect, frequency, etc.). Real-time update of the actual report data and the remaining time of the news. Refresh the data manually whenever you want. 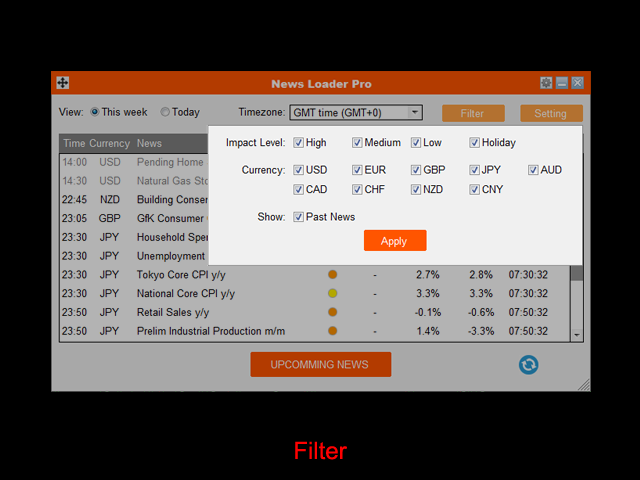 Filtering types of news to be displayed (impact, currency, ...). Alert before an upcoming news release. No alert in midnight time (local time) to keep silent while you are sleeping. Send notification to your mobile and/or email before an upcoming news release. Show the news release points on the chart. Very professional and flexible interface (Windows-like style: allows you to drag, resize, maximize and minimize the panel). This week: All news of the current week will be shown. Today: All news of the current day with selected time zone will be shown. Timezone: Select time zone that time factor of news will be converted to. There are 3 options: GMT time (GMT+0), server time (time zone of your trading server) and local time (local time zone of your computer). Impact level: Select, which impact level of news will be shown. Currency: Select, which related currency of news will be shown. Show past news: Show/hide the passed over news. 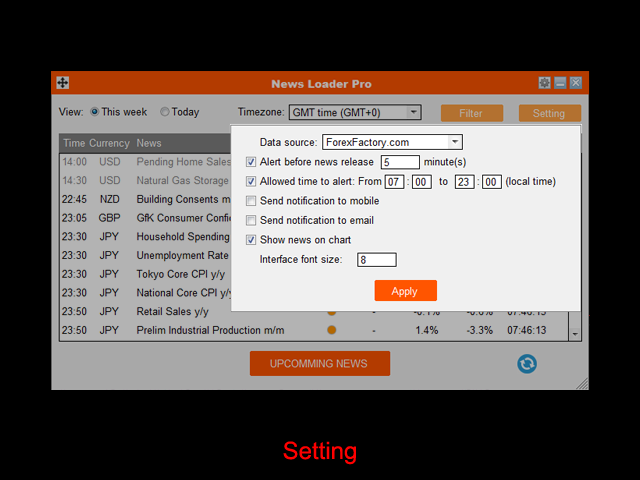 Data source: Select, which data source will be connected to load the news. 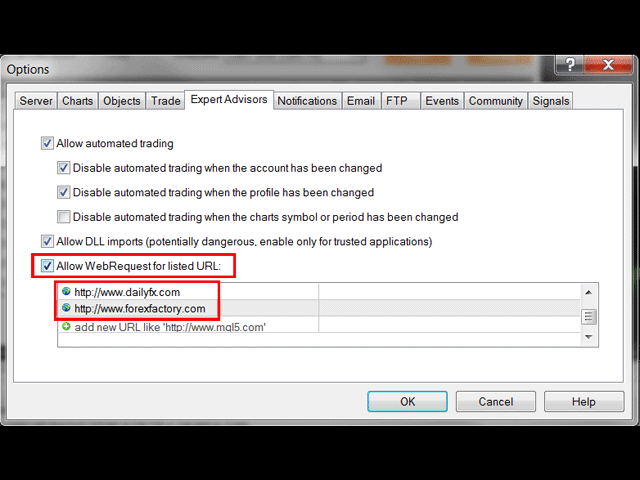 In the current version, 3 data sources are available: ForexFactory.com, DailyFX.com, etc. Set alert: Set the amount of minutes that program will alert before an upcoming news release. Allowed time to alert: Set the period of time when alerts are allowed (usually, it is day-time of your local time). The program will not alert you out of this period in order not to disturb you at night time. Send notification to mobile/email: Send notification to your mobile/email before an upcoming news release (you should setup notification and email settings correctly in your MT4). Font size: Select the font size that fits with your screen resolution. Hovering mouse over news in the list will show the detailed information about that news. Clicking on a passed over news in the list will shift the chart to the marked point of that news. 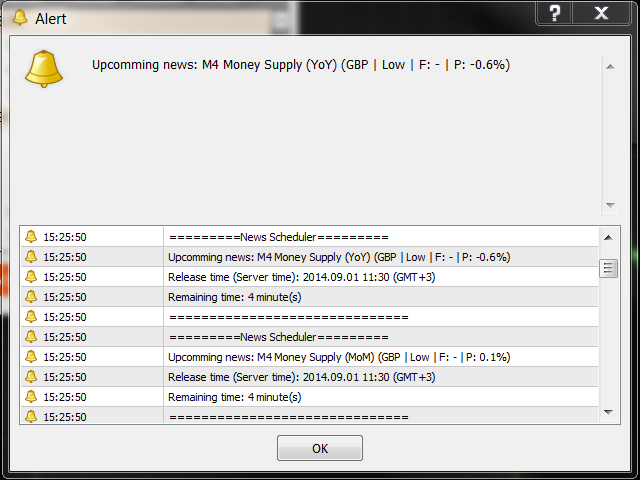 ForexFactory.com is the most selective resource, and a bit slower in data update during news releases. DailyFX.com is a medium selective resource having medium speed in data update during news releases. - Improved: More compact when minimize. - Improved: Auto scroll to upcomming news at start-up. - Improved: Less annoyed for asking to add data source's URL.